I have tried to give an explanation for many of the road names in Grange. Some of these are fully researched elsewhere, whilst some are educated guesses or transposing meanings from elsewhere. Others I just can't work out. Any advice welcomed! Along with Priory Crescent / lane all part of a development probably named after Abbots Hall to the south. Created sometime between 1910 and 1930, so unlikely to be connected with Prince Albert. The road to Allithwaite from Grange. I suspect this means the field belonging to Andy, although some older spellings have it as ‘sandyfield’. This seems unlikely, unless there is sand there – which I haven’t seen – it’s on a limestone slope. Bailey generally relates to castles or land managers (bailiff) – none of which really apply here. It could possibly be connected to a ‘warrant officer’ if customs were applied (although the customs officer lived at Windy Harbour). Another possibility could be field of bay trees, as the spelling varies depending on where you look. A further suggestion is ‘berry clearing’ or ‘berry wood’ and this is particularly used in Lancashire, but there is little to show that all this was wooded. Again – probably related to trees in the area. Probably an area dominated by berry trees at one time. blár (Old Norse) Dark, blue, livid; cheerless, cold, exposed. viðr (Old Norse) A wood; or a tree, a tree-trunk. During enclosure processes there was almost always a plot of land given to the church to replace the loss of tithe income. Hampsfield Fell was enclosed in 1796, and this plot was for the Bishop of Chester. The origin of its name, describing a juvenile Robin before it acquires its distinctive red breast, is obscure. The Grand Hotel was known as Brown Robin House when built by the Liverpool sheet metal magnate turned banker W.E. Maude in the 1840s, becoming a hotel in the 1880s. Before that, local Jacobean connections indicate a link with a Scottish fable about a princess’s secret lover, called Brown Robin. But no-one knows for sure. Probably named after places in Scotland or New Zealand. Road down to the shore where the Carter lived for crossing the sands (Carter was also their family name for some generations). The road to Cartmel from Grange. Cateri is Cymric for a ‘wide spreading oak tree’. Possibly a French topographic name from a derivative of charne, a dialect variant of Old French charme ‘hornbeam’, ‘witch elm’. Although I would be surprised if either of these grew locally. Then again, one may have done – and the unusualness of this may have led to the area being named as such. The Well in the area, which was at the top of what is now Charney Well Lane – there is a small recess in the wall. These are all above High Farm, just below Hampsfell. Why they would have been named after cockling I don’t know, as there would not have been any cockles anywhere near. Unless it is a derivation from something else where the spelling has changed over time. The fields were called ‘Cockle Wells’ back in the inclosure award of 1796. Commercial Inn – purely a business name. Don’t know when it changed to ‘Commodore’ (post 1900) but presumably to give a nautical flavour. In 1829, the directory only listed the 'Bay Horse Inn', which was presumably this. The carter / guide over the sands had a Bay Horse (there's another Bay Horse Inn at Canal Foot, Ulverston - the end of the Leven Crossing). After Hard Crag – it was built in their grounds. Links Park Road (Esplanade) with Kents Bank Road – a ‘cross road’ in old highway terminology meant a road linking two more important roads. Probably named after the Crown Inn, which stood on the corner – which was probably just a pub name rather than anything significant (it was called that by at least 1820). Mrs. Sophia Deardon, a local benefactor, presented the clock tower to Grange. Mrs. Deardon also donated woodland around Yewbarrow Cragg to Grange as a recreational facility for local people. Alludes to the meadow and brook within it, close to Eggerslack Wood (now underground) up which the little stream the “eayer”, “boar”, “head of the tide” according to tradition, used, before the construction of a sluice there to rush up with a roar. Hill of Ferns (a lot of ferns still grown in Grange). The area at the south-eastern end of this road was Fern Hill before the road was built. Although, some renaming has gone on – the original Fernhill Road carried on northwards, and then curved round to meet the new Highfield Road. All this section is now Highfield Road and Fell Drive. Off Fernleigh Road – built in 1913. Originally called Wilson’s Road. 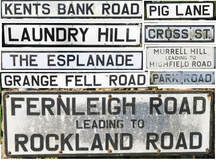 Fernleigh comes from the house at the town end of the road. Leigh comes from lēah (Old English) A forest, wood, glade, clearing; (later) a pasture, meadow. So, either a clearing with ferns, or a field of ferns. Granby is the Old Norse personal name Grani + bý ‘farmstead’. The road could be named after someone with that surname, or after the Marquis of Granby. Old French Graunge meaning a barn or granary where the monks of Cartmel Priory stored some of their grain. Or possibly from the Latin Grancia – meaning grain). Originally the term Grange related to any granary, but latterly came to specifically refer to an outlying farm belonging to a religious house or a feudal lord, where crops were stored. Thwaite = þveit (Old Norse) A clearing, a meadow, a paddock. Graythwaite Manor was built in 1890 by a retired banker from Bradford, a Mr William Martello Gray. So, it most likely names after him rather than anything else. hǣð (Old English) Heather; a tract of uncultivated land. Greave is Old English for copse. Scandinavian Hägg is an ornamental name from hägg ‘bird cherry’ (Prunus padus). This is one of the surnames drawn from the vocabulary of nature and adopted more or less arbitrarily in the 19th century.English : from Old Norse Hagi, which has been identified as a byname from hagr ‘deft’, ‘dextrous’, although it could equally well be a habitational name meaning ‘the enclosure’, see Hagen.South German : variant of Haack. But Hagg also means peaty or boggy ground in Cumbria dialect. Not sure which one Hagg Lane refers to. Road to Hampsfield Fell. Commonly corrupted to ‘Hampsfell’. This road was previously (1796 enclosure award) known as ‘The Hampsfield Road’ – which continued along the foot of Hampsfell to Hampsfield. Ham was the second son of Noah. foel/voel is Cymric for field or fell, fjeld is Norse for field or fell, and fjell is Scandinavian (fell). So – it could mean Ham’s field on the fell, or Ham’s fell. Oldest house in Grange (1653). I suspect the name purely reflects the situation of being under the limestone fell. Mere could either mean lake or boundary – the former more likely if it was named after the ornamental gardens were created. Hazel is presumably from the tree. Hydropathic Establishment in the hazel woods. In 1796 the way to High Farm from Grange Fell Road was called ‘Spring Bank or Height Road’. Height, presumably because it led to High Farm. It passed though the farm and ended at the point where the Hampsfield Road came up from the town and turned off across the fell. A new development, named as it towards the top of the town. Possibly not really reflective of the actual site as this road was developed in 1910-1930. But it was presumably on fields higher than those below. The highest farm in Grange – being just below Hampsfell. Holme actually also means island, so this is tautology. ‘Holme’ particularly refers to islands in lakes or creeks (estuaries?). Therefore ‘Kents Bank’ – Residence or place on the banks of the River Kent. Road from the centre of Grange towards Kents Bank. It’s longer than you think, as it extends beyond the junction at the fire station. The main route from Ulverston and Flookburgh down the hill to the ford across the Kent to Lancaster. Kirk is celtic for Church. Half way up the hill on the right (now Hillside) was the Sunlight laundry for many years. (below that was a panel beaters / body painter, opposite were stables, and above it were Mews and a grocers shop – just showing how much change can happen in one small area). The road to Lindale. This was not the original road to Lindale, which was the top one. The bottom road was built in 1875 after the reclamation of the land following the construction of the railway. Linden is another name for Lime Tree, whereas Fold is a staked off pasture area or shelter (as in sheepfold). Lyme probably comes from the limestone nature of the town. Hurst is Old English for wooded hill. Grove means copse or thicket. The road to Meathop from Grange. Merle is French for blackbird. So – Blackbird Wood. Methven is a Scottish surname derived from a place in Scotland with the same name. The roads were probably named after the house at the foot of the road. The slope from the Main Street looking out towards Morecambe across the sands. Probably from a family name. Murrell is derived from Morel, a nickname for someone of dark complexion (a moor / black man). Nut / Hazel – all derivatives of the same thing. Oreton is a small village in Shropshire. So other than the first owner coming from there, I can’t think of any other reason. The ‘over-Sands’ suffix was added in around 1858 by Reverend Wilson Rigg, the first vicar of St Pauls, who was fed up with his post going to Grange in Borrowdale. This is the wooded area behind the Netherwood towards the Grand. Not sure why it is called Paradise Hill, unless it is merely whimsical. I suspect this might be the case, as it wasn’t shown on this on the 1850s maps. Maybe it was given that name as part of the hotel developments to entice guests? Starts at the northern edge of Park Road Gardens (at Cross Road) and runs alongside the park to the junction with Kents Bank Road. But oddly, it was called Park Road on the 1880s maps, despite their being no park there until 1930. So, it must have referred to some other park, or parkland? Pen is celtic for Head, end, top, height, a hill, whilst garth is Norse for small enclosure, usually near the house. "Picklefoot" takes its name from walnut pickers who lived in Main Street. Hardcragg Hall had its own piggery, and it is thought that the site was where the library now is, giving rise to the name Pig Lane. Beatrix Potter stayed at Hardcragg Hall and met a ‘friendly porker’ and hence ‘Pigling Bland’. Not sure if this area was dominated by Pines, it looks like fields in 1880. However, there are quite a few well-established pine trees near there now – so quite possible. In the Enclosure Award of 1796 a short road ran from Spring Bank Lane to the field newly allocated to Postlethwaite (local landowner / farmer). The road was for their private use (now a public footpath). Along with Abbots Lane all part of a development probably named after Abbots Hall to the south. The Rigg family ran hotels and holiday tour coaches. In 1872 Thomas Rigg took the lease of the Grange Hotel in Grange-over-Sands and became the ‘hotel-keeper’ until his death in 1913. Riggs Close is built where the Hotel's tennis courts were. Probably a name meaning rising up out of the dale/valley. Probably named after Rockland House, which is self-descriptive really. Early maps don’t show a well here – but it’s close to Charney Well. This is in the woods on the path from Slack, and is a shallow, almost natural well. On the Inclosure Map it is ‘slack well’. Routen is German for ‘routes’, and is a German surname. So, possibly named after a previous owner of the woods? Probably named after the tree – possibly because there were Rowans there before building on the land, or possibly just because it sounds nice. The old private carriage road running from Slack, north-ish through Eggerslack to Hampsfield (now a footpath) – it passed Routen Well in the woods, or ‘Slack Well’. (See High Road). Presumably it is Spring Bank because there was a good spring along the way. The 1880 25” OS map shows two pumps at Spring Bank Farm, so it is likely that this is related in some way. An Avenue is a wide, usually tree-lined road, path, driveway, etc., through grounds to a country house or monumental building. Our Avenue (and Fernleigh Avenue) has none of these characteristics. And The Crescent isn’t really crescent shaped. An Esplanade is synonymous with Promenade - a long, open, level area, typically beside the sea, along which people may walk for pleasure. Our Esplanade is more of a road than anything else. garth is Norse for small enclosure, usually near the house. Used to be a nursery. This used to be fields and pastures, so probably a reference to the hedges alongside the fields. Trickett was a farming family – and this was one of their fields for many years. When developed in 2016/17 the development was named Trickett’s Drive (the developers wanted it to be called Shoreside, but fortunately the council said no). The Old Parsonage on Grange Fell Road is near this - Vicarage Close was built in some of it’s gardens/land. Named for Queen Victoria. It was originally going to be named Jubilee Hall, as it was opening in 1901, but was changed. I don’t know why. The main route to Windermere. Before 1875, it was also the main route to Lindale. In the Enclosure Award of 1796 it is called ‘Slack Road’, Slack being the small collection of houses a little way from Grange Town. The area around the roundabout at the foot of Main Street was shown on the maps prior to the railway being built (1853) as ‘Windy Harbour’. How much of a harbour there actually was here, and how windy it actually was is unclear. Wilkinson’s Wood stretched all the way from Grange Fell Road down to Kents Bank Road in the 1850s. Wood Head was at the very top of this wood, and mush of the prime building sites were owned by the estate. Yew because of the tree, and barrow means in Old English a wood or grove, and in Celtic, a hill. It could be either here – bit I suspect the latter, as in some older photos Yewbarrow really wasn’t as densely wooded as it is now – it was quite open and craggy. Early guide books talk about the panoramic view, which is hard to get now.